How Far is Geotech Blessings? Geotech Blessings is an exclusive residential community which spreads across lush grenery offering you a peaceful lifestyle. The entrance of the project is befittingly grand that is a true delight to one's eyes. The creators have ensured that you get the widest range of amenities, thus making life a lot more comfortable. The beautiful and elegant homes are tastefully crafted so as to lead a luxurious lifestyle within your comfort zones. The project is the perfect combination of high quality construction, world-class amenities and vibrant living spaces that provide blissful living. The unmatched quality is reflected in every corner of Geotech Blessings that truly meets urban sophistication. During the past decade Indian Real Estate sector has witnessed tremendous transformation in terms of infrastructure, revenue growth and project execution. Indian builders are coming up with innovative ideas and delivering international standard projects which can be considered best in the class. National Capital Region has emerged as major hub of real estate activities in the country. Mr. Raushan Prakash, who has been part of this exciting development story. He has become some sort of personal brand in the region because of relentless passion for excellence, innovation and quality. His favourite one liner is "An entrepreneur is never satisfied with his work. He had traversed a long distance, still he feels: The journey has just started! " In 2010, he founded Newtech, another real estate company with some of the like-minded partners. The company has launched La Galaxia in the Greater Noida near Surajpur. This project is on the verge of completion. Construction is in full-swing in another project La Palacia (Greater Noida West).Realizng growth potential of tier-II cities, company has also launched La Sheetla in Patna, state capital of Bihar. Being a serial entrepreneur, passion to do something new and different has always inspired Mr. Raushan Prakash. This is why he started Geotech Group. Raushan Prakash, after spending more than a decade in the industry, felt that in order to realize his vision he will have to chart out an independent course and this when Geotech Group came into existence in the year 2007. 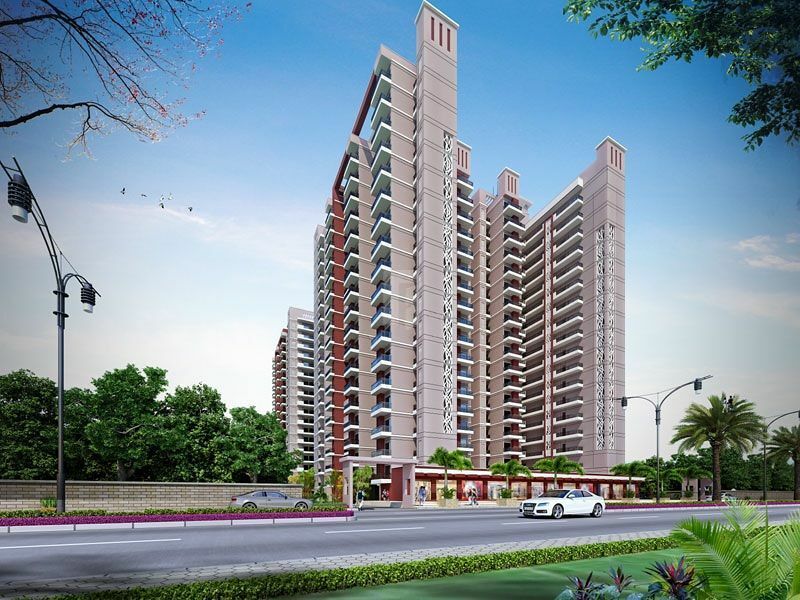 The company has launched ‘Geotech Blessings’ which is a multi-storeyed project in the fast-developing Greater Noida(West) region. The biggest USP of the project has been that all necessary approvals have already been taken by the company unlike other builders who keep their customers in dark. Raushan Prakash feels that to change the way industry functions it was imperative that someone takes the bold step. Geotech, A leading real estate company in India, is engaged in all key segments like residential, commercial, retail & hospitality. The company’s operation encompasses various aspects such as land identification & acquisition, project planning, designing, marketing and execution. To continue our efforts for expansion and growth through true customer delight, utilizing the latest technology for successful business and happier lifestyles. To establish everlasting relationship with our customers by delivering unrivalled services at fair and market competitive prices. We are committed to build up the business, keeping in view, the overall betterment of the society. All our projects, existing and under construction reflect class, style and comfort. The journey of Geotech Group is largely about making a difference, without compromising on quality. Our constant efforts towards improving the effectiveness of our quality management systems make all our constructions worth emulating. Right from raw material selection to the processing stages, till the final product, constant quality checks are carried out. We at Geotech strongly believe that quality is not the responsibility of a particular department or a person, but of the organization as a whole. Quality of the project is not compromised at any cost or at any level. Hunger for doing something new has always been hallmark of Mr. Raushan Prakash personality. Customer has always been focal point of his endeavours in whatever he does. He is among very few builders in the Ghaziabad region who decided not to charge hidden cost from the buyers. His pro-customer approach was evident once again when in the Morpheus group when he decided to sell the flats directly to customers completely eliminating the middleman between buyer and developer. We firmly believe that quality of construction is of most important aspect of real estate business and we consistently work hard to create value for our customers and business partners. Using human resource and by harnessing the technological prowess, we create finest landmarks. For over decades now, Mr.Raushan Prakash’ name has become synonymous with trust, transparency and credibility. Honesty is not just a word for him, but it is a way of life. We believe in creating spaces that enhances quality of life. We are committed to offer residential products that are ahead of the times and are one of the best in their category. As a leader, he envisions a future, where Geotech becomes a symbol for quality and reliability and becomes household name in the country. Our brand should be symbolised as the finest landmarks offering highest standards of quality and customer delight. His vision is to provide roof to every homeless Indian. Geotech is constantly working towards creating new benchmarks of architectural excellence in the contemporary global environment. In this new environment, the demand for multi-faceted real estate development has become crucial for keeping pace with the progress. Capitalizing on these demand dynamics, we at Geotech have always taken new initiatives and emerged as one of the prominent entities. Geotech introduces quality into every aspect ranging from Process, Human Resource, Technology and Services to create an all-encompassing quality culture. Developing collective willingness towards the discipline of doing things right, by using perfect planning and state-of-the-art technology and delivering highest quality standard to its clients. Our strong Quality Consciousness and quest for continuous up gradation for ultra modern life-style and luxurious living standard. Our clients' interests are paramount priority for us. We want all our clients' investment to be safe & profitable. Geotech always try to research, innovate and improve on service quality. The company also provides the most accurate information and added value in order to fulfill our clients' demands.